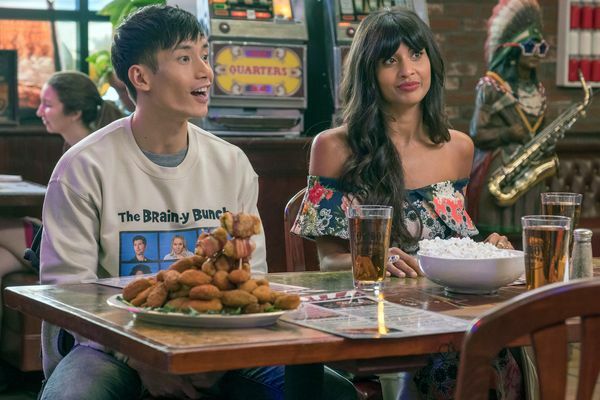 The Good Place Season Finale Recap: It’s Been Real, Dog Holy mother forking shirt balls! The Good Place Recap: Unhappy Medium The Good Place introduces us to the Medium Place. The Good Place Recap: Pobody’s Nerfect What if the Good Place isn’t actually all that good? 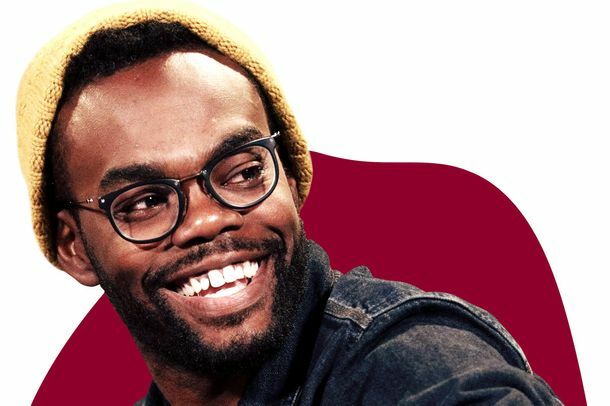 The Good Place Recap: Trés Ladies “Chidi’s Choice” is an early candidate for 2017’s sweetest TV love story. The Good Place Recap: Hell Is Other People Eleanor Shellstrop, meet Eleanor Shellstrop. The Good Place Recap: The Hole Truth “Category 55 Doomsday Crisis” is the best episode since the pilot. The Good Place Recap: Better and Bitter “Tahani Al-Jamil” answers two burning questions about The Good Place. The Good Place Series Premiere Recap: You Don’t Belong Here Michael Schur’s new afterlife sitcom is clever, funny, and pleasantly familiar. The Good Place Season-Finale Recap: Hot Diggity Dog! In “Somewhere Else,” Michael proposes yet another afterlife innovation. 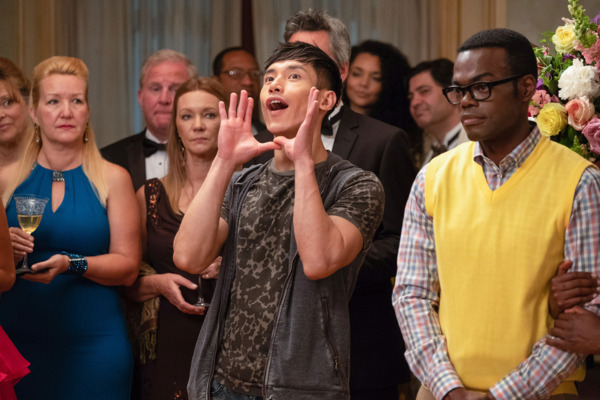 The Good Place Recap: The People’s Court Do these people deserve an eternity of torture just for being selfish, vain, indecisive, and Jason? The Good Place Recap: Exit Through the Gift Shop “Rhonda, Diana, Jake, and Trent” is an action-packed and riotously funny episode. The Good Place Recap: There Goes the Neighborhood “Best Self” is a poignant and poetic episode. The Good Place Recap: There Goes the Neighborhood “Best Self” is far from the flashiest Good Place episode, but it’s one of the most poignant. The Good Place Recap: Boom, Roasted No torture in the Bad Place is as diabolical as Michael’s comedy roast. 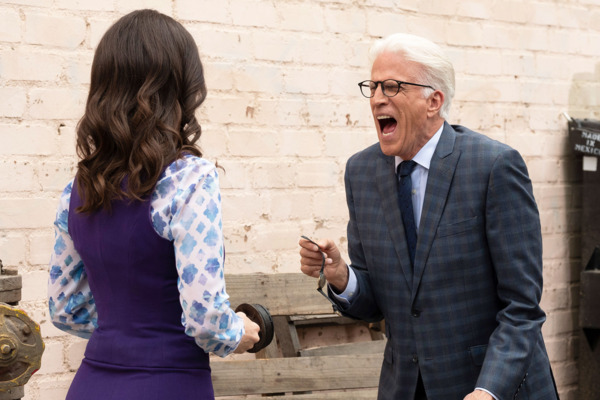 The Good Place Midseason Finale Recap: Who’s the Man? Michael and Eleanor are slowly learning that it’s not easy not being mean. 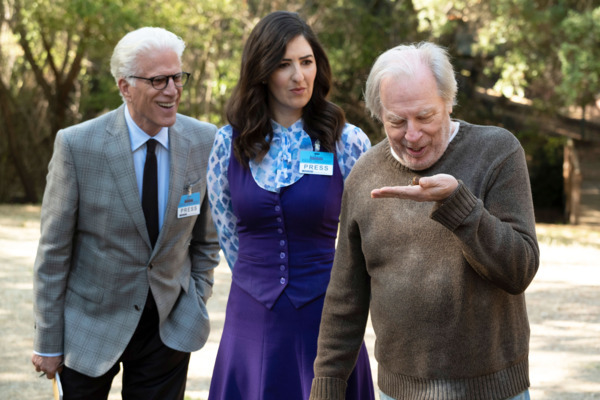 The Good Place Recap: Damn It, Janet A well-earned spotlight on D’Arcy Carden’s terrific performance. The Good Place Recap: All Aboard! Chidi, Eleanor, and Michael face off against the trolley problem. 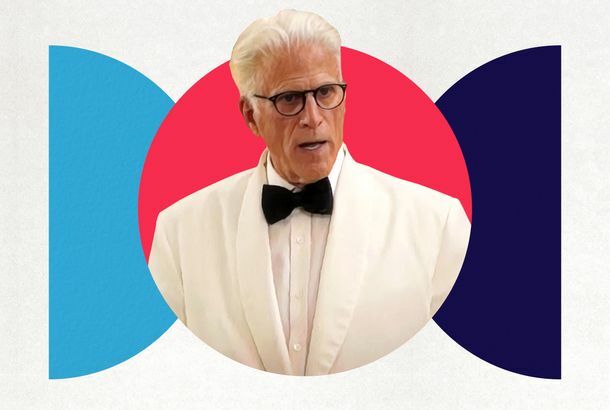 The Good Place Recap: Party Crash Even in a subpar episode, Ted Danson is a joy to watch. 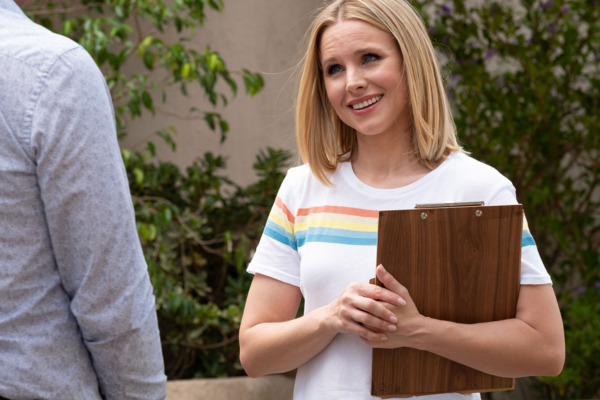 The Good Place Recap: The Better Battle Will Eleanor agree to team up with Michael? The Good Place Recap: The Better Battle After two weeks of clever alternate realities, The Good Place settles down and scales back. The Good Place Recap: The Show That Never Ends There is no shortage of Bad Places in this week’s episode. Episodes 1 and 2 Everything Is Great! The Good Place Season-Premiere Recap: Starting Over (and Over) “Everything Is Great!” is a fiendishly clever way to blow everything up. 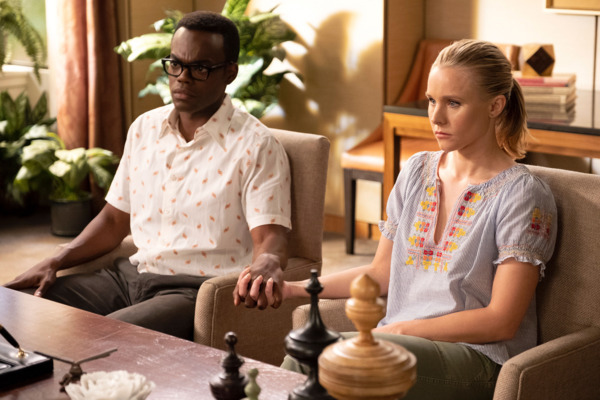 The Good Place Season Finale Recap: Memories You May Have Forgotten The show ends the season by hitting yet another reset button, to diminishing returns. The Good Place Recap: The Neighborhood Play A busy episode brings the gang back to where they began — sort of — in a last-ditch bid to change how modern humanity is judged. The Good Place Recap: 4 Oreos from Paradise Even in the Good Place — or at least its mail room — nothing’s as easy as it seems. The Good Place Recap: Void (Where Prohibited) “Janet(s)” is a clear dividing line in the history of The Good Place. 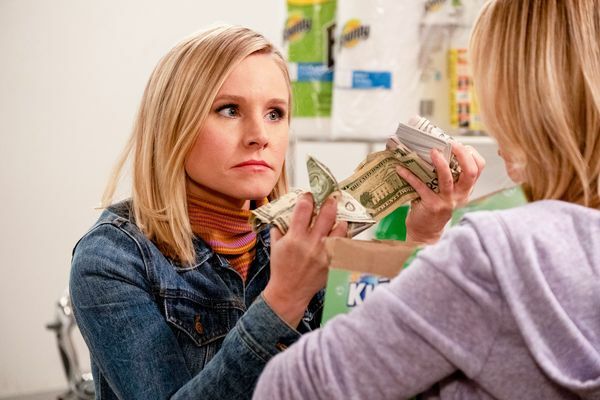 The Good Place Recap: True North The arrival of a pivotal character marks a standout episode that also features one of the most entertaining sequences of the entire series. The Good Place Recap: If You Choose Not to Decide … Just as the show seems to be edging further backward into familiar territory, it makes a welcome leap forward into the unpredictable. The Good Place Recap: The Parent Trap A transatlantic pairing of family reunions retreads familiar ground, but unearths some genuinely moving moments in the process. 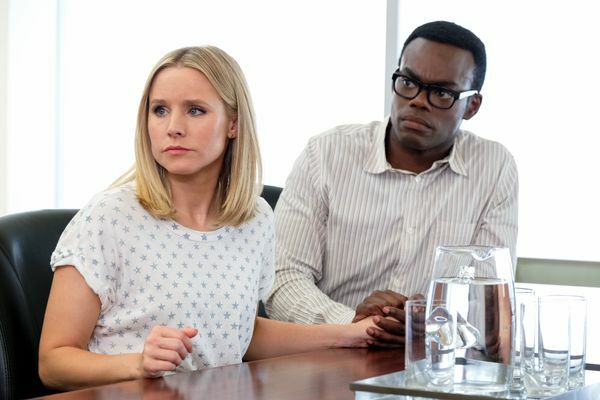 The Good Place Recap: Daddy and Them We learn the secret of Donkey Doug in an episode that takes part of the gang to Florida while those left behind ponder breakup ethics. The Good Place Recap: Give It Away Now A metaphysical revelation throws the group into an existential crisis (and for one, that means making weird chili). The Good Place Recap: Perfect From Now On A playful episode skips through time before ending on a cliffhanger that could, once again, change everything. The Good Place Recap: The Butterfly Shrimp Effect Trevor tries to sow discord and finds the show’s central foursome all-too-easy pickings. 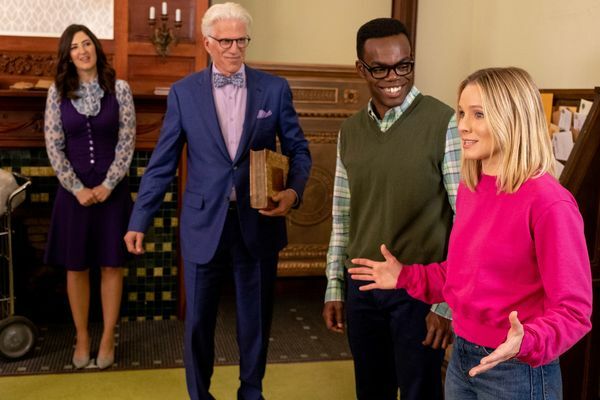 The Good Place Season-Premiere Recap: Return to Oz Season three kicks off by catching up with gang’s adventures back on Earth.